I love that my daughter and her husband live in the same town. That means that this grandma gets to see her cute grandbaby more often. I remember when she was born last year in another state and how hard it was to only be able to spend one day with her after she was born. I also remember heading back to the airport and trying to figure out when I could fly out to Vegas to visit them again. I am so glad that God made things happen and they were able to move back to Albuquerque last November. That means not only do I get to spoil that cute baby but it also means that I can introduce amazing healthy products to my daughter. My younger boys also love being uncles. 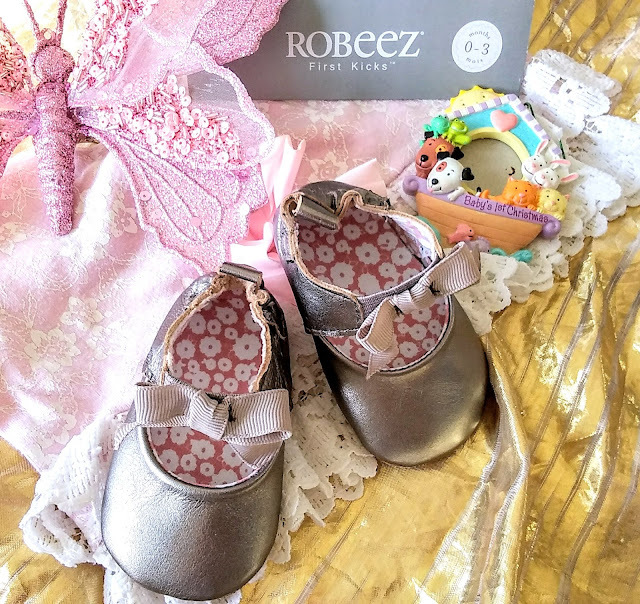 This grandma also got to celebrate the baby's first Christmas and spoiled her with tons of gifts like these cute baby shoes from Robeez. More about the baby shoes later in the post. I think my granddaughter's favorite Christmas gift was the newspaper. The baby has been an easy baby for the new parents so far and my daughter and son-in-law have been doing a great job adjusting to parenthood. Last month the baby started having some troubles with sleep and it was then that her mom discovered that she has sensitive skin. My daughter decided to try some baby lotion with lavender in it and the baby broke out it a rash. At first, my daughter thought it may have been the carrots or the lotion that gave that cute baby girl a rash but after discontinuing the baby lotion, the rash went away. The baby also started sleeping better. So while my daughter was disappointed that she could not use the lavender lotion anymore, she was glad that it was not the carrots. My daughter has been careful with what she feeds the baby as my daughter has plenty of food allergies including peanuts. So I told my daughter to start using essential oils like lavender in the oil diffuser that I gave her to help the baby sleep. The problem with diffusers is having to fill them up with water every night and that can be a pain when you are holding a baby. So I was glad to discover roll-on essential oils that are made for babies. Since Oilogic essential oils do not contain toxic chemicals, there is no worry about skin rashes on the baby. The oils are diluted 100% Pure Essential Oil solutions that are ready to use topically on your baby as early as 3 months+. Baby safe products are always good for kids with sensitive skin. I tried the Slumber & Sleep Essential Oil Roll-On on my son's neck and it did not irritate his sensitive skin. To be on the safe side, I told my daughter to rub the roll-on essential oils on the baby's clothes or sheets. 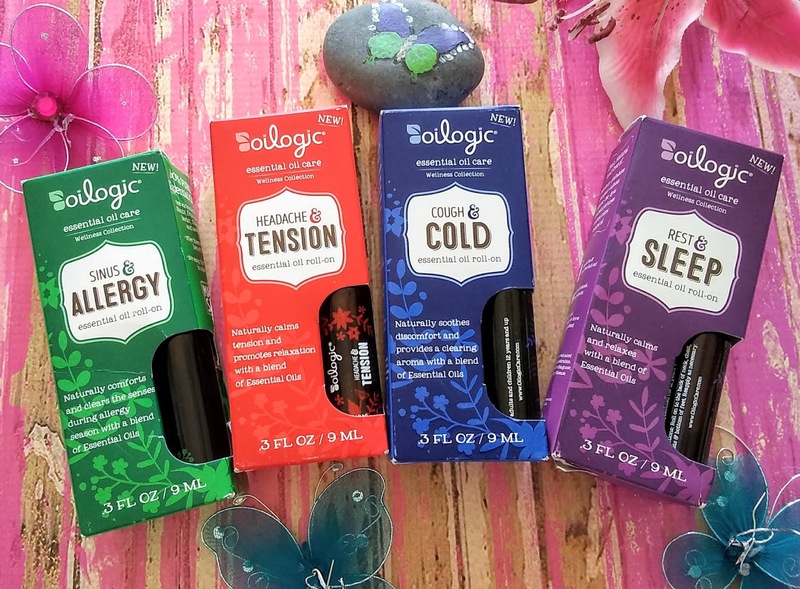 These amazing oilogic oils come in a set that also includes essential oils for colds and tummy problems. The baby has not had any colds or tummy problems thus far but my daughter will be prepared. I think the essential oils are great for aromatherapy too and I love the way the smell. I am glad that they make essential oil roll-ons for adults too. So I am prepared for allergy season with the Adult Wellness Essential Oil Roll-On Bundle. 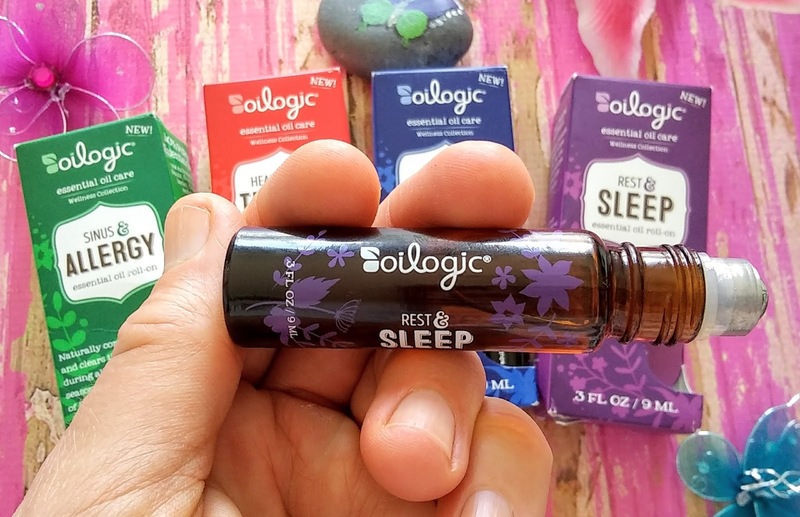 Essential oils help me sleep too! I have troubles sleeping and have many things that help me fall asleep but I am loving how easy it is to roll on the Rest & Sleep essential oil on my neck before bed. I breathe in the natural fragrance and it helps me to relax to fall asleep. 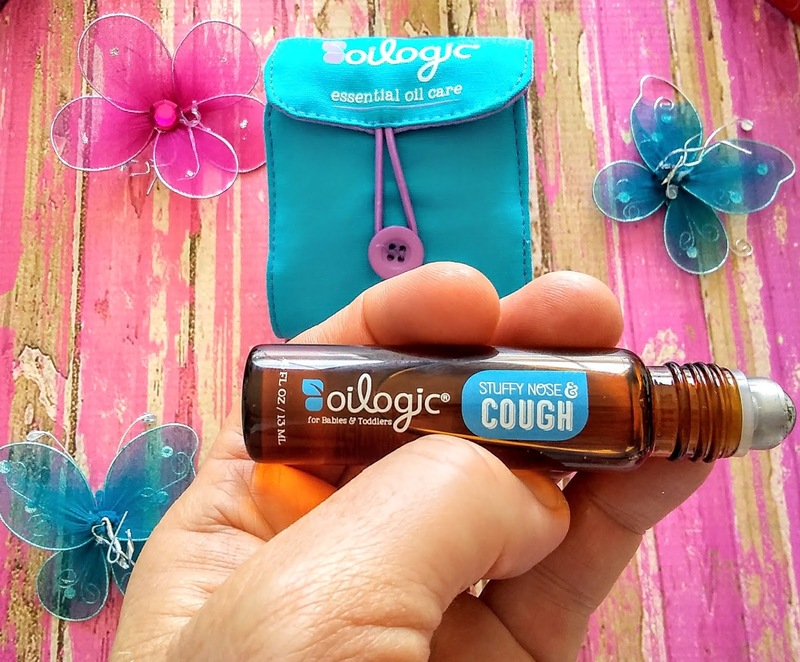 My youngest son was having an asthmatic cough the other night so I rub the Cough & Cold formula on his chest and the essential oils soothed his cough so he was able to fall asleep. 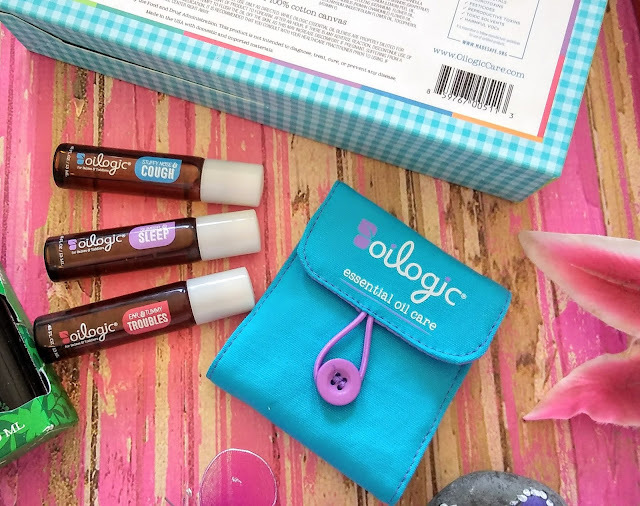 These essential oil care products are the perfect size for my purse or pocket! Robeez sent me two pairs of the cutest baby shoes ever. I remember my youngest boys wearing these shoes when they were babies but the ones that they wore had animals on them. 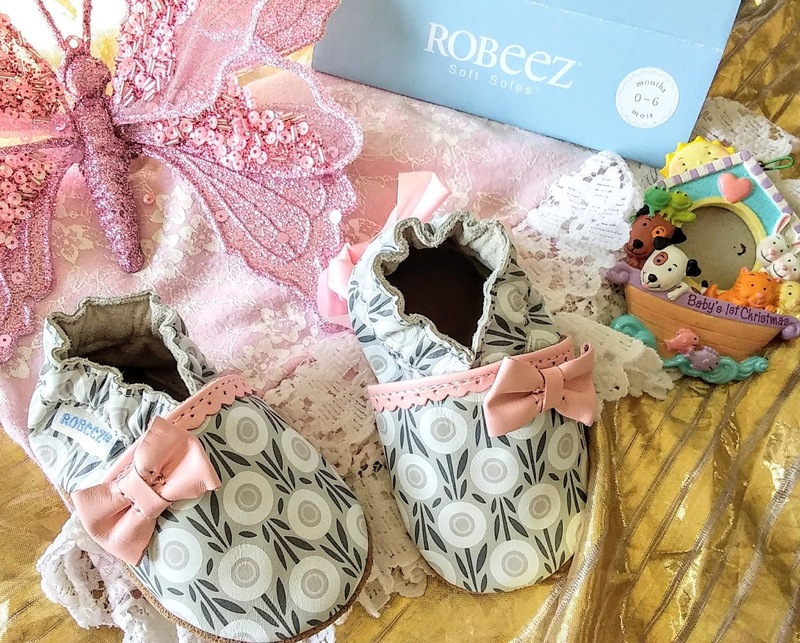 Robeez are my favorite baby shoes as they stay on, unlike those cute baby socks. These shoes have soft soles and are also perfect for baby's first steps. I love how easy these adorable baby shoes are to put on. My granddaughter has small feet so she was only able to wear the silver baby shoes. The ones with the flowers will be perfect for her first Easter. The selection of shoes that Robeez has for both boys and girls is amazing. I am thinking that my grandbaby needs another pair or two of shoes as a girl can never have enough shoes. This baby girl has the cutest clothes and she needs matching shoes. Do you have favorite baby products that you love? I have zero idea about baby products but I must say that all these look good. Especially the essential oils. Oh these are all so adorable! It is great to hear you are loving being a Grandma as well! These are the cutest thing ever! I don't have babies but a friend of mine is expecting so this came right on time. Thank you. Too sweet! I've always liked Robeez. I think my kids had some when they were tiny. I love all these gift ideas. Though i no less about baby products. But will be expecting my baby soon and will keep these in mind. I know my mother loves being a grandma too. It's definitely a special time in life to cherish. I could have used the lavender roll-on essential oil for my babies! I was thinking about how I could use that for me to sleep when I scrolled to the next section where there were adult sized versions! LOL Thanks for sharing! Good to hear that you have the opportunity to visit your grandchild often because you live in the same town. Those shoes are super lovely! I had no idea that there were essential oils for babies as well. That's a good thing! Wow, there are oils for babies? That is awesome! What an adorable idea! I didn't even know that this existed. I love how practical they are. Definitely a great help for all the moms. I am so happy that you get to see your grand baby more often now that they have moved back. Those shoes are too cute! Great review! I have never heard of these products before so it was super interesting to read about! I had never heard about Oillogic. I HAVE TO HAVE the sleep and rest one!! My 3-year old is incapable of going to sleep and drive us completely crazy lately. It is so hard for her to soothe down. 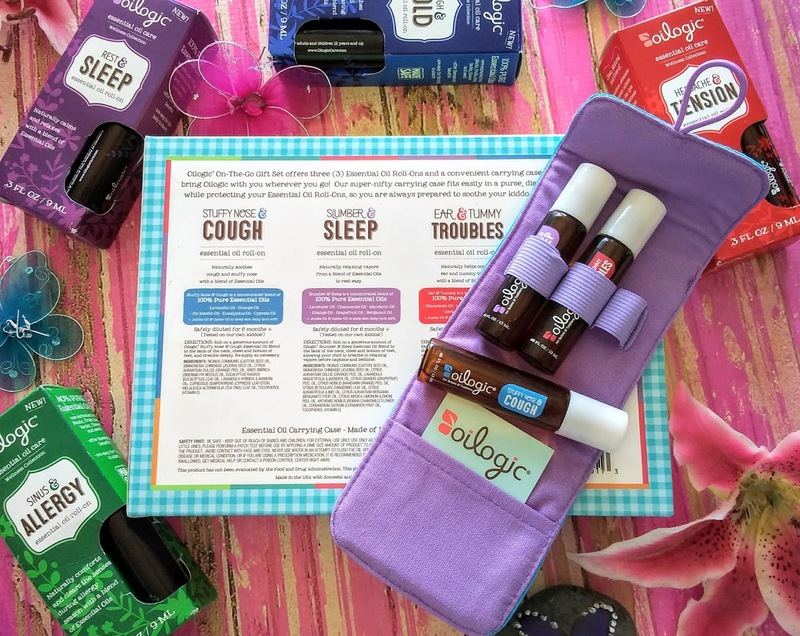 I love essential oils but didn't know about roll-ons for kids!! Oh my gosh...so much cuteness in this post! I'm sure parents love that you are raising their awareness.